As part of our commitment to disseminate research and good practice we have set up a website to enable news and information exchange on demand responsive transport (DRT). We have also produced an information pack and video/DVD showing current schemes in the UK and Europe. MTRU currently chairs the information exchange and pressure group for local authorities and operators working on DRT. Its activities are reported on the drtbus website. 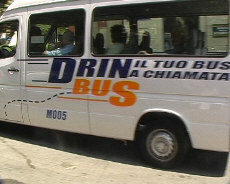 To visit the site click here or on the picture of the Drinbus (from Genoa) on the left.